Grab a spew bag, because floaty space exploration game Adr1ft has a substantial nine minute gameplay video for you to watch. It's the most generous footage we've seen so far and it looks really beautiful, providing you can stomach glacially-paced, low gravity movement. I don't have a good history with this stuff (1990s space shooter Descent made me feel wretchedly ill) but maybe you'll fare better? The Oculus Rift launch title is expected to release at the beginning of next year. You won't need VR to play it, but after watching the footage above I'm pretty certain that's how it's meant to be played. Sam Roberts got his hands on Adr1ft back in March, and enjoyed it. 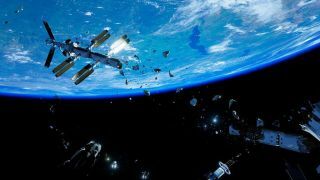 "Playing the 10-minute demo of Adr1ft is something I’d class as a genuinely memorable and worthwhile experience," he wrote.